For a century, our vision, our work, our heart has been focused on improving the way people live. And nowhere is that commitment more alive than in our outreach efforts, inspired by the principals of our founder, Mr. Konosuke Matsushita. Mr. Matsushita's business philosophy consists of fundamental principles that begins with "Gratitude" and ends with "Contribution to Society." From the beginning, we’ve been driven to create positive change through technology. But our mission goes well beyond the products we develop. 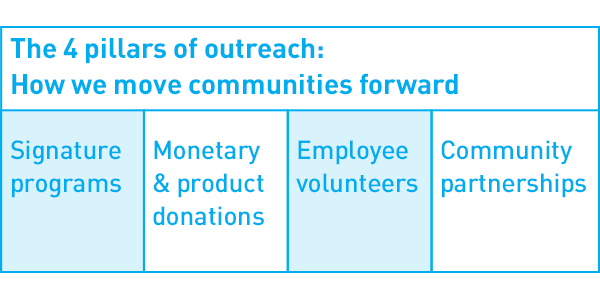 We’re committed to enhancing quality of life through community outreach programs that help schools and families, donations to worthy causes, collaboration with local government, and employee volunteers. At its core, our mission is to apply positive energy toward a greater good. You can see these efforts come to life through Panasonic initiatives in Newark, New Jersey, our corporate home, and through signature programs such as Kid Witness News, Creative Design Challenge and Eco Diaries that help students reach their full potential. We are confident our outreach efforts have made and will continue to make a big difference in the lives of those we have touched, and that making a difference will continue to be synonymous with the name Panasonic. Contribution to Society - it's not a moment, it's a movement. Panasonic Volunteers invested more than 3,000 hours of service in home renovations in partnership with Habitat for Humanity.